Burned-out after years of doing development work around the world, William Powers spent a season in a 12-foot-by-12-foot cabin off the grid in North Carolina, as recounted in his award-winning memoir Twelve by Twelve. Could he live a similarly minimalist life in the heart of New York City? To find out, Powers and his wife jettisoned 80 percent of their stuff, left their 2,000-square-foot Queens townhouse, and moved into a 350-square-foot “micro-apartment” in Greenwich Village. 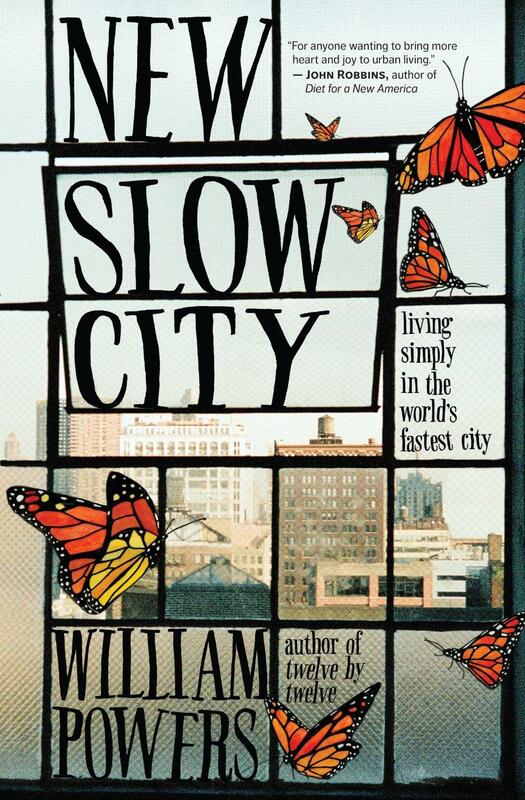 Downshifting to a two-day workweek, Powers explores the viability of Slow Food and Slow Money, technology fasts and urban sanctuaries in his new book, New Slow City: Living Simply In The World's Fastest City. In his book, The End of Absence: Reclaiming What We’ve Lost in a World of Constant Connection, Michael Harris places our situation in a rich historical context and helps us remember which parts of that earlier world we don’t want to lose forever. He urges us to look up—even briefly—from our screens. More than thirty years ago, Christopher Lasch hinted at this bleak world in his landmark book, The Culture of Narcissism. In The Impulse Society, Paul Roberts shows how that self-destructive pattern has grown so pervasive that anxiety and emptiness are becoming embedded in our national character. Yet it is in this unease that Roberts finds clear signs of change—and broad revolt as millions of Americans try step off the self-defeating treadmill of gratification and restore a sense of balance. The follow-up to the award-winning anthology Goodbye to All That, Never Can Say Goodbye is also a celebration of New York, featuring contributions from luminaries such as Elizabeth Gilbert, Susan Orlean, Rosanne Cash, Nick Flynn, Whoopi Goldberg, Phillip Lopate, Owen King, Alexander Chee, and many others. Author and editor Sari Botton joins us this morning.